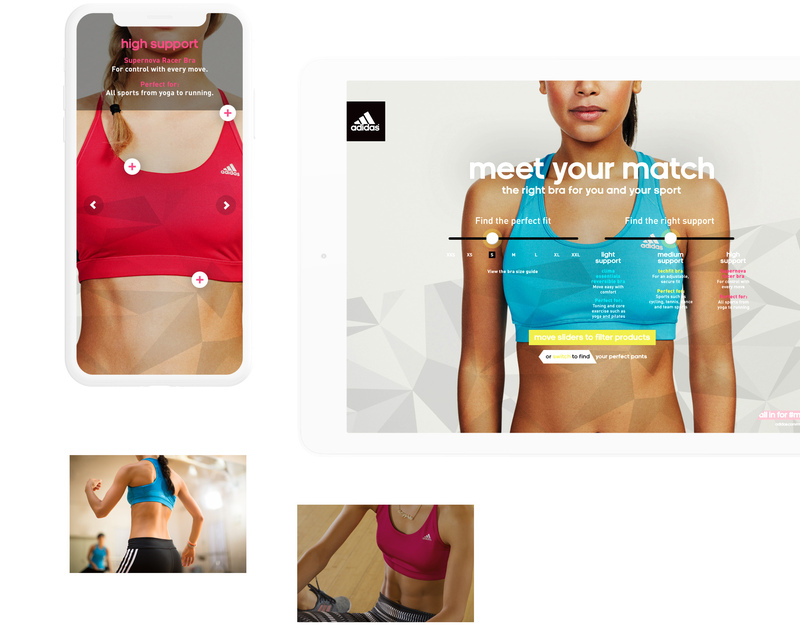 Sports Bra and Pant Retail Tool — the Adidas Retail Team, tasked Knight Studios with developing a website and retail tool, that would allow customers to search and filter their products. Customers would input their personal apparel requirements and the tool would filter the products, presenting only the ones that were appropriate to that customer – an interactive personal shopper. Immersive and interactive from the moment you land on the home screen – the customer slides the toggle left or right to select either the bras or pants for viewing. The toggle pulses to attract attention and enrich the shopping experience. That same toggle and slider mechanism is employed within the product filter interface too, aiding the customer's product discovery and selection. As the user explores the size, fit and support options, the background images change to display that relevant product type. Inspirational photography shot in contemporary fitness spaces helped to enrich the visual design and give the tool a crisp, graphic and vibrant environment to live. This striking identity ensured the tool was a huge success as it lived and grew across the Adidas website, embedded in their retailer's sites and also within the Adidas brand stores and outlets. Our partnership with Adidas UK & I continues to grow year-on-year as we help support and service their Social and Retail Teams across the UK, Europe and the US. We have designed several other retail tools, for customer use in their retailer's websites and as attractor pods in stores.